I enjoyed A Spark Unseen more than its predecessor, probably because the main character was not constantly questioning her sanity. Katharine has a clear head (for the most part) throughout the novel and must do her best to enter Parisian society while looking for Lane - all while keeping her uncle hidden. The help in this novel is also nowhere near as scary as in The Dark Unwinding, but the family Katharine found in the house is still not anyone that I would've liked coming home to. As with TDU, you could never tell whether many of the new characters were good or bad, but it lacked the tension. (Trust me, I enjoy it a lot better when I'm not trying to read ahead because of anxiety attacks.) Plot twists were also plentiful, but not to the point of confusion. I liked the writing in this novel a lot. The one thing thing that was "meh" about the story was the resolution of the romance. It was far too easy, and I don't think the one-sided knowledge was really fair. 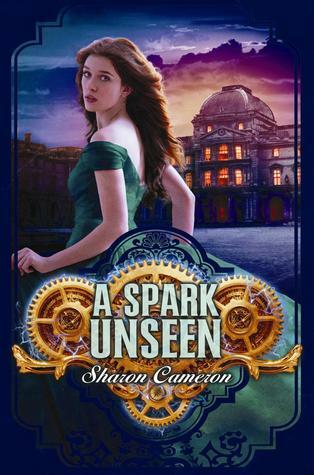 Cameron's writing in A Spark Unseen sucked me in and transported me to Victorian England and Paris. The descriptions of everything from the house in Paris, the side streets, and the catacombs made me feel like I was right there with Katharine. One of my favorite scenes of the book was Napoleon III's ball, which I could almost see. The descriptiveness was beautiful. I'm glad I did not skip A Spark Unseen since I liked it so much better than the first book. I think any fans of historical fiction and mysteries of all ages will enjoy the series. I was asked about the tour of this and was on the fence, just because my schedule is so full, but if you liked it even more than the first, I definitely need it in my life! The first wasn't my favorite book, but the writing in it was good. I think I was thrown off by not knowing whether or not Katharine was mad because I have to know if I'm dealing with an unreliable narrator. I think you'd enjoy it since you liked the first, but it isn't nearly as creepy or tense.